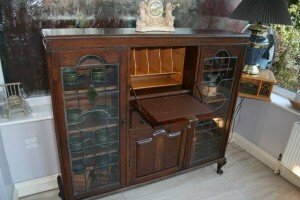 An antique mahogany unit on paw feet, having two glass inlaid cupboards aside a centre drawer and two cupboards. 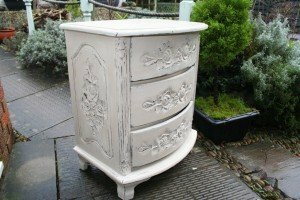 A small heavily carved chest of three drawers, hand painted in cream in the shabby chic style. 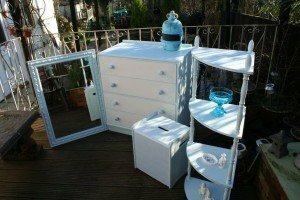 A suite of shabby chic blue furniture, to include a chest of drawers, a storage stool, corner shelves and a large mirror. 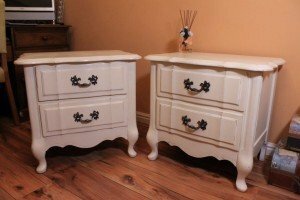 A pair of hand painted solid wood chests of drawers, each having two drawers with cast iron handles. 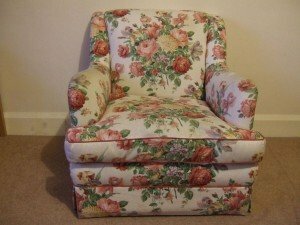 A vintage high back gentleman’s armchair on mahogany legs, upholstered in floral patterned velour. 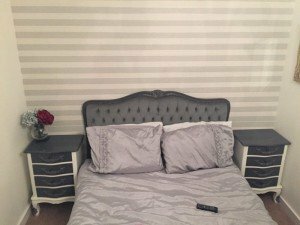 A three piece bedroom furniture suite, includes a double grey velour bed with mattress and a pair of grey and cream bedside drawers. 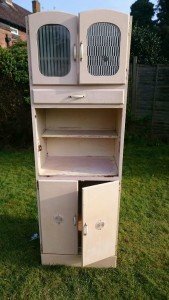 A tall standing pink solid wood retro kitchen dresser, having two central shelves with a drawer and a cupboard to the top, and a double door cupboard underneath. 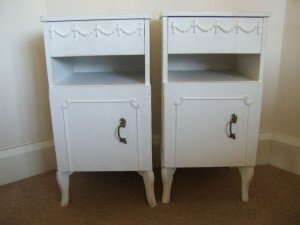 A pair of shabby chic bedside units, hand painted in cream with brass handles to the doors. 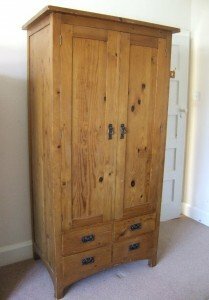 A tall standing solid pine double wardrobe, having two doors above four drawers. 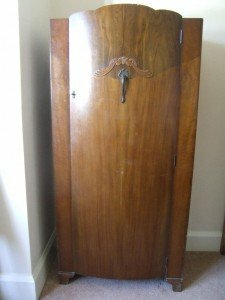 A vintage tall standing solid wood single wardrobe, having one key locking door opening to reveal one cloth rail. 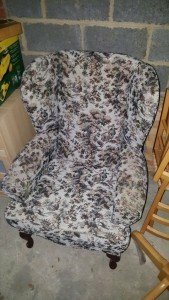 A vintage high back armchair, upholstered in a heavily floral patterned fabric with curtain drape to the bottom. 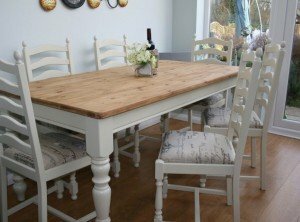 A solid wood rectangular dining table in the shabby chic style, together with six matching high back dining chairs. 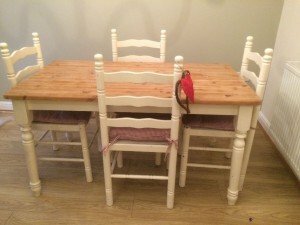 A solid wood farmhouse dining table, together with four dining chairs and four gingham chair cushions. 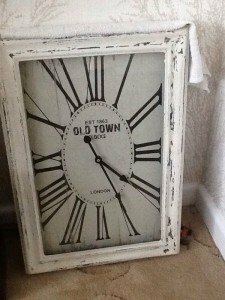 A large rectangular shabby chic London clock in a hand painted white solid wood frame. 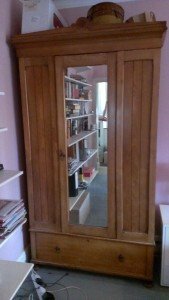 A tall standing solid wood triple wardrobe, having one mirrored door above a large drawer. 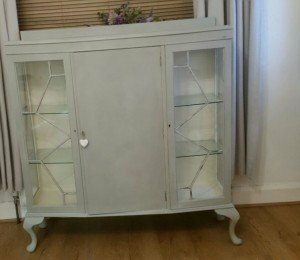 A solid wood and glass panelled hand painted side cabinet, having one door opening to reveal two glass shelves. 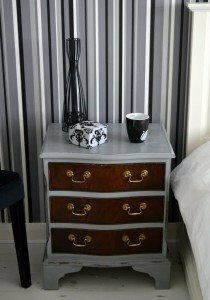 A vintage mahogany chest of three brass handled drawers, hand painted in grey in the shabby chic style. 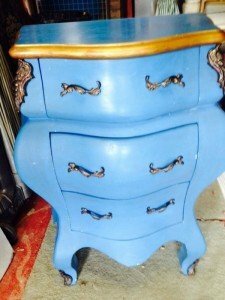 An unusual shaped chest of three drawers in the French style, hand painted in bold blue with cast iron detailing. 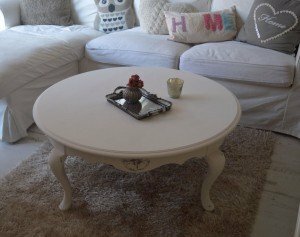 A large circular coffee table hand painted in cream, together with a large cream shaggy area rug. 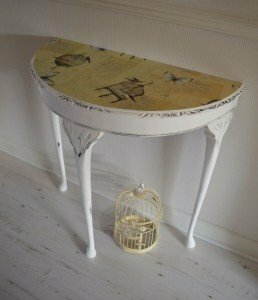 A carved solid wood shabby chic console table, hand painted in cream and decoupaged to the top in birdcage and butterfly paper.